You may remember me briefly mentioning in my last post that I had some trouble with the second blue chair on my craft table project. ‘Some trouble’ unfortunately turned into another DI-WHY disaster. I ended up having to scrape all the paint/wax/sealer off and trying to work out what went wrong. 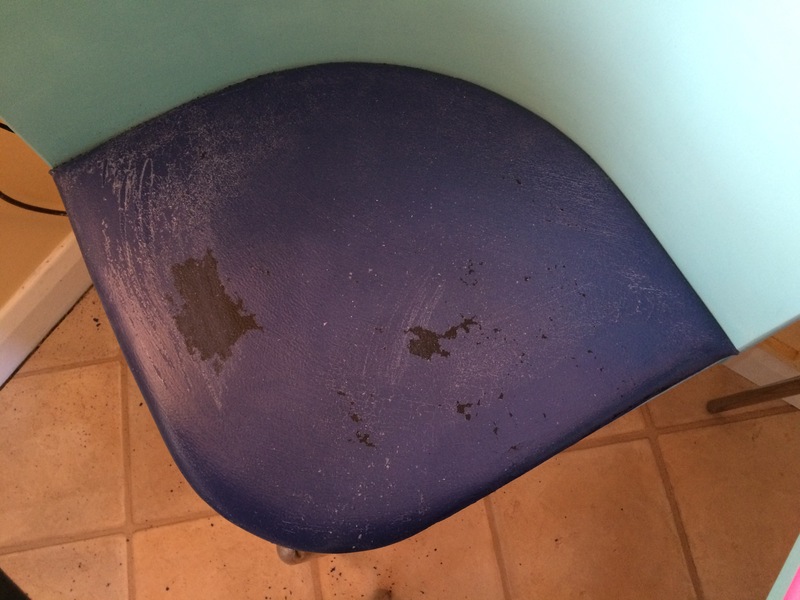 The wet wax was definately one issue but I also suspected I had forgotten to spray down the chair with water before putting on the paint. I’ve read that if you don’t do this when painting fabric, leather etc. the paint can sit on top rather than absorb in and then crack. So I did it all over again, with the water this time and everything seems fine now. The only problem is I haven’t got the smooth shiny finish of the other chair as all the scraping ruined the leather slightly in places. Anyway, lesson learned! The rest of the chairs are still doing well, except one which needs slight retouching after my daughter Annabel decided to bite the back of it. Furniture and teeth don’t mix! It is great having all the paint and tools at my disposal for the retouching though, something that you don’t usually have when furniture gets scratched or damaged. I’m being very cautious about the sofa now so am doing several test runs on the backs of sofa cushions before I commit. I’m honing my technique and the kids loved being told to jump on and throw my first test cushion to their hearts’ content yesterday. It’s still a work in progress but I’m still fairly sure I’ll be giving it a go in the next few weeks. Another thing I’m trying for the first time at the moment is decoupage (with Lego wrapping paper!) so I will hopefully be posting about that very soon. It may turn into a new obsession as it’s quick, easy and has endless possibilities. I love it!! 1. Use wallpaper or contact paper to cover the panel in the doors or the back of the shelf section. I really liked this idea and it seemed easy but I was a bit worried the paper might start peeling off and look awful fairly quickly. This involved painting and I had a little pot of Rust-oleum chalk paint in ‘flint’ that was begging to be used so I decided to go with this option. How hard could it be? In fact, I remembered helping my mum to stencil a border around the kitchen when I was a teenager (all the rage back then) so surely I already knew what to do? One fact I forgot was that my longterm memory isn’t so great. 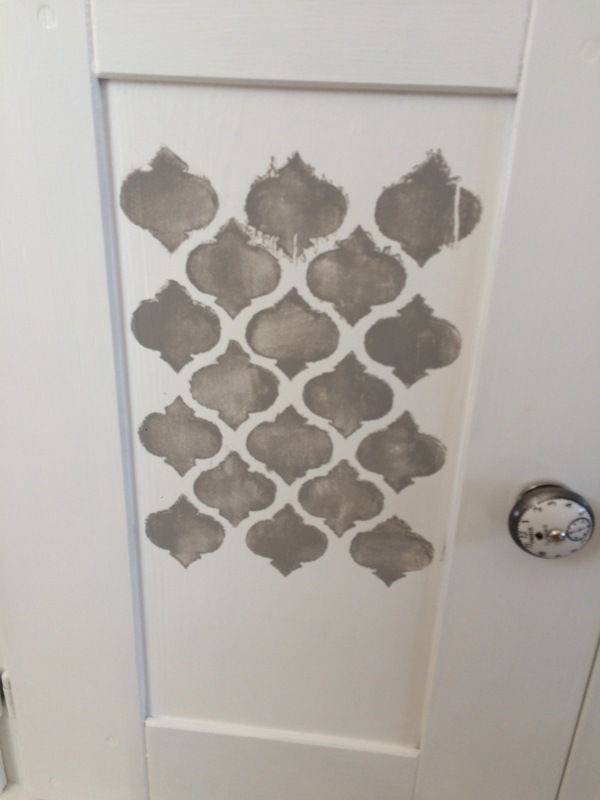 Due to impatience (previously mentioned) I looked at lots of pretty pictures of amazing furniture but didn’t really read in detail how to actually DO stencilling. It seemed pretty straightforward. Big mistake! 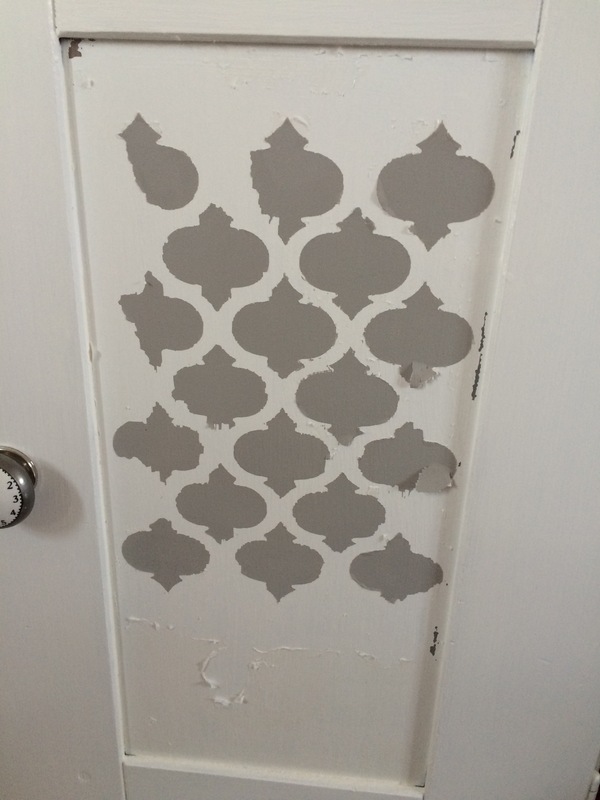 Error 1 was to happily paint the adhesive directly onto the cupboard door and stick the stencil on it (thinking I was following the instructions on the back of the tin correctly). Almost straightaway I started having doubts. The areas to be stencilled felt pretty sticky (not paint-friendly) but I optimistically assumed the adhesive would magically disappear when needed or have no effect on the paint so I carried on. Error 2: I chose a mini roller for the job, partly because it was new and cute and I wanted to try it out. Then the nightmare began. Each time I rolled the paint up and down it slipped on the adhesive and disappear in patches. I tried a brush but that was even worse so went back to the roller and just kept on waiting a bit, trying again, waiting a bit etc. until I had a vaguely even covering of paint. Surely it would all turn out ok? (sometimes I take a while to catch on). Due to all the coats of paint I didn’t dare take the stencil off straight away so left it overnight to dry. Despite having the right technique, I needed a fair bit of practise to get used to using the right amount of paint on the brush. Fortunately, I have finally had some good results so hope to post the finished result soon. I’m also waiting for the arrival of a ‘paint pen’ which I’m hoping to use to do some border work on the unit (fingers crossed for no more DI-Why?!? issues). The take away message is that stencilling is not easy, or at least not for impatient not-very-artistic beginners like me! In fact, if I’m being honest I first directed the term towards my husband when he tried to put a TV up on the wall. As you may have guessed it fell off. And broke. And we’d had it less than a day. Ouch. Anyway, I have a tendency to get a bit impatient and rush things. As I mentioned in my piano stool post I needed to glue the legs in on one side as they kept coming out of the main frame. I put some glue where I thought it should be and then tried to push the two bits together by hand. This got me nowhere so I picked up the nearest thing to hand and start bashing (deeming the mallet in the under the stairs cupboard too far away.) Unfortunately, my object of choice was a pot of wood varnish that I’d just bought for the chest of drawers. After about 2 whacks the lid popped off and every drop of varnish poured out all over the carpet (yes I hadn’t even thought to use the bottom of the tin.) In my rush to clear up I then knelt on the tube of superglue that I had left on the floor with the lid off. Then got it on my hands. Then tried to peel some off and peeled off some skin as well. Then had to wear a jungle animals plaster for the next 3 days. Hopefully I’ve learnt a bit from the experience and will strive to do better next time. I suspect, however, this won’t be the last time a DI-WHY?? moment occurs. 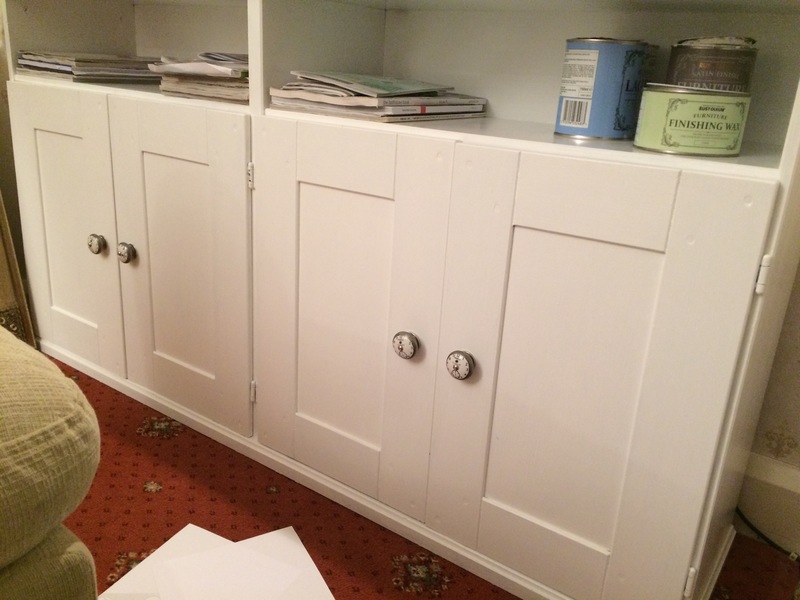 Quick update on the chest of drawers…I used an electric sander for the first time today and it was FUN! !